Many of you would remember my article on Heart rate training and how your resting heart rate can effect or tell your body condition. While these data are good to know and will help and aid in your personal quest for better fitness (and what better way since we are now in Day 2 of 2013?). Today, i will try to share with you my own understanding on Lactate Threshold and in particular, how to identify your Heart Rate Threshold. This is important in many aspects and by the end of this article, you might just understand and know why. Heart Rate - What Tells? I've been training with a heart rate monitor (HRM) since almost forever. 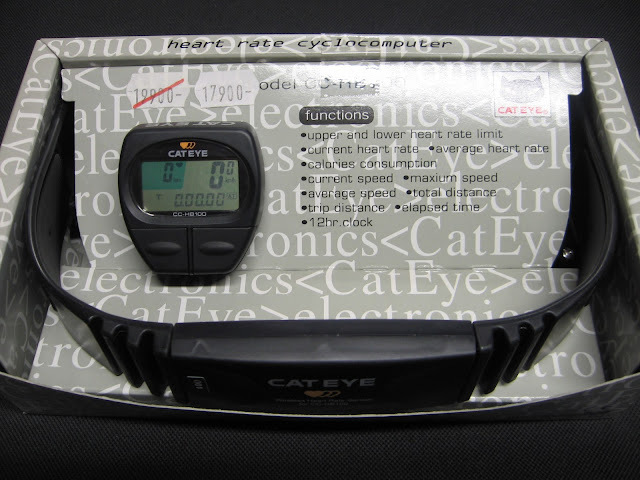 My first HRM was a cool unit that was incorporated into the bike computer (Cateyes HB100). Those were the days I get to purchase these at a discount due to me working in a bicycle shop (which explained to you why I can fix bikes and tune them, It's a lifelong skill). A HRM will be able to tell you your heart rate at the instance you see it. Not all are made equal and the better (and expensive) ones is actually electrocardiogram (ECG) accurate aka as good as a medical equipment. Now assuming that you do have a HRM or equivalent (as in some phone apps that could do the same, but take it with a few beats here and there). Now, we all know that the most basic calculation of your Maximum Heart Rate (HRmax) is the known 220-age. There is nothing wrong with that formula. Only thing is, it's too generic. As we all have differing fitness level, my 60% effort (of HRmax) could not be your 60%. Our body reacts differently to training, food and the exercise load. For me, i could be burning fat only at my 75% and some people could be doing so at 50% (level of fitness and inactivities factored in). Another analogy i could share is this : Lets use speed as a gauge to our aerobic fitness (aka exercising with surplus oxygen). A person with better aerobic capability will register a lower heart rate. Likewise, between two equally capable athletes, whoever that can maintain the same heart rate at an increase speed definitely has the better aerobic capacity. This alone is the very basic of you starting to monitor your own fitness and improvement. The key to training with a heart rate monitor is determining your training zone. If you had missed this before, it is OK. It took me almost 7 years to come to the realisation that having a HRM is not just for look or to feel like an accomplished athlete. To determine your training zone, you first need to determine your LACTATE THRESHOLD HEART RATE (LTHR). There are many ways to determine your LTHR. Some requires sophisticated equipments only available to top athletes or in a well equipped medical (sports) facilities. The other "free" way, assuming you are like me, with no access to these facilities is to use our own ability to determine it. Before you read on further, you need to understand that you will need to commit (aka put 100%, if not 101%) to this, else, the data gathered is as useless as using 220-age. This is how I (suggest to) do it. a. Get everything ready (gear wise) and make sure you are at your best for the test. You will be treating this LTHR as your race day. If you watch has an auto-lap function, I suggest that you disable it. The reason is for the HRM to record specific duration as the test goes on. b. Warm up. 1-mile is a good start. Easy conversational pace (or in my case a 10min/mile (aka 6:12min/km). Press the LAP button immediately it reaches 1.6km or 1-mile. c. Immediately after the first mile, start picking up your pace and run at race pace (mine happened to be 4:20min/km) for at least 30minutes to 50minutes. The longer, the better. Remember, commit to race pace. You don't slow down, at the very least maintain, or do it at your 100% effort. Press the LAP button once you hit 30minutes to 50minutes. d. Warm down for 1-mile. Catch your breath. Press LAP or stop the watch. Depending on your fitness and terrain, I am expecting a minimum of 8km to 12km covered in this 1-hour duration. Remember that the LAP that you pressed in Step 1? It's time to look back at the data and look for your AVERAGE HEART RATE for that 30mins to 50mins of HARD RUN. That is a good estimate of your LTHR. I say estimate as it is only as accurate as your effort ;-). For this purpose, I've always used my Tempo run as a gauge for my overall fitness. Tempo run, performed up to three times a week gives a fairly good accurate data of your personal fitness. I did a Hill Tempo (combination of Hill work and Tempo workout in one). I scored a new LTHR based on this run. 158bpm. If this is your first time doing this, remember not to blast your pace during the first few KMs, pace yourself as you will need a more representative data points to make your test more accurate. My average heartrate for the whole 13.3km run was 157bpm. When i sync-ed my workout into TrainingPeaks.com, it automatically calculate and inform me if I have a new threshold. The online software is smart enough to identify only workouts that has met the LTHR self-test criteria (aka running for certain period at certain or existing LTHR and yes, pace) to recommend a new numbers for improvement. Happy with the numbers? Remember that it will keep improving, and you might actually hate it. You see, LTHR will only go upwards, meaning the next improvement will mean it will be higher (aka at higher heart rate) than what you already have. I improved from 154bpm about 2 months ago to 158bpm on December 31. That simply meant i need to "push" 4-beat higher just to get the same quality workout. And if done properly, simply meant improved overall fitness. If you want to find out what is your LTHR for cycling and/or swimming or other sports, repeat the above for you specific sports. Next : Translating the LTHR to your training zone. I will provide a guide to useful numbers so you can use the training zone for recovery, maintenance and improvement. Meanwhile, go get your LTHR done! as always, good explanation, sir. Thank you. do it a few times for a good average. If you do it the first time, chances of you pushing too hard the first 10minutes is there and then you will run too slow the remaining 40mins for the test results to be accurate. stupe - what are you thoughts on the difference of actually running at max rate to get your max hr and then calculate zones from there? does it end up being the same as your method? You will not be able to do that. There is a reason for the Lactate Threshold as that is the "line" between "doing enough" and "doing more". Muscle fatigue happens when the muscle is flooded with lactic acid (hence the "LT training"). By training at your LT (and beyond) you are training your body to metabolise these lactic acid as energy and flushes them out before it accumulate to the point of no return (muscle fatigue). When you train using your Max HR and calculate from there, you will "perceived" to be training at the right zone. Example, my HRmax if i go all out (consistent) is 173bpm , translate that to 85% will be 148bpm - which fall short of my LTHR. And at 148bpm, i am on autocruise and just working at my Zone 2 or maintainance...not even at my Tempo, let alone at my LT zone. Article on translating the LTHR to training zone is scheduled on Tuesday. I rely/read a lot from Joe Friel (Triathlon Training Bible). thanks for this. I will try it out. for some reason suunto "insist" on using HRmax instead. I will noodle on it abit. Maybe off topic slightly, I have found that my running vs cycling HRs are 10-15 ticks lower (later being lower). this data was taken from a few of my bricks and also from powerman last year. Seems to have 2 schools of thoughts on the above is normal or should remain same... what are you thoughts on this? Perhaps Suunto has a different way of calculating to derive back at the similiar, if not same numbers. Bearing in mind that Garmin uses the most basic formula too, taking into account the resting HR. SO their numbers are also lower. I guess the like of Suunto and Garmin tries to be "on the safe side" and would rather be generic than risk law suits coming their way as more people get cardiac arrest due to untrained cardiovascular system attempting to exercise at lactate threshold they never knew existed. You are on topic with the cycling vs runnign HR. Your HR while cycling is always lower compared to running - same reason why you need to put in more effort into cycling to get the same/similar workout effect as running. My article on the training zone addressed this and the differences (in %) is between 1% to 4%, with the higher differences more relevant in the lower HR range (for recovery). As you get closer to the LT, the % differences is minimal. Of course, you need to establish your BIKING LT. and my Bike LT is about 10bpm less than my running LT.
My HR maxed out at 210 last Sunday running with Shangpion in the trails. When I run, be it for 5 or 10 clicks, I have a very high average heart rate >165bpm. My own personal test is always the "hello" test. If I can have a decent conversation with you while i'm running, i'm still ok. Problem is I can have a decent conversation with you when the heart is beating at 180bpm. Could be a wise choice bro. But what is your resting? For as long as I know you, that has been always the case, and not as if you are NOT fit. Resting is low 50's. I am not overly worried about it lar I guess. Maybe just a little lar, overworking my poor heart. LOL!